Great question Andrew – one that deserves answering. The stalemate outcome analysis also feels plausible given it is hard to imagine the Libyan rebels have either the equipment, training, resources and resolve to topple the Libyan government, with or without air support. Occupying vast swaths of the country may simply be sufficient for the rebels to achieve their goals – to force Gaddafi to accept he can no longer rule the country alone. So in short, Gaddafi has as simple choice. He can fight and try to win outright (or gain enough leverage so as to create a negotiated outcome that would achieve the same outcome as winning). This has the benefit of huge upside if he wins (with disastrous outcomes from the west – expect some retaliatory terrorism) but it also has more dramatic downsides. If he loses, a complete loss of power, death and/or imprisonment all seem very likely. So this is a high stakes path. Alternatively, he can choose to negotiate. This route has more ambiguity, something that presents a risk in of itself (a reason why the back channels will matter so much – see below). 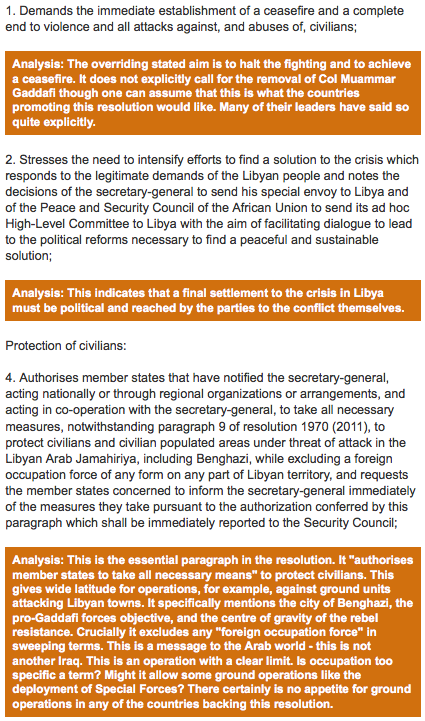 Here the upsides and downsides are slightly less extreme, although there is a possibility of an outright “win” for Gaddafi is not off the table completely. Given these choices it wouldn’t be inconceivable for Gaddafi to choose to fight at first to test the resolve of the Allies and the rebels (something we are seeing now) and, should that not work (which it probably won’t, but could) he can always change gears and retreat into a stalemate negotiation and put forward offers that attempt to fracture the rebel coalition. If he can do that, he could still win back enough support to retake the country, find some way to influence the next government, or at worst, be forced to retire. I’ve tried to sum all this up on a choice matrix below. The sum of it is, the top lefthand outcome seemed a certain outcome a few days ago. Now the allies are forcing the right column back into the picture. Have downsides down the left become significant enough? And the upsides or exit strategies for Gaddafi on the right certain enough to chance the calculus? That’s really the question – but I do think it remains a possibility. There are, of course, at least two other parts of the puzzle that need to be in place to ensure that Gaddafi isn’t forced into fighting. 1. Someone would need to back channel to him the allies intentions: that the UN resolution is designed only to force a stalemate, not oust the current government. It might be logical for Gaddafi to then try to continue fighting and see if he can win despite the airstrikes (as this would maximize his leverage) and, he can always choose to back down later. 2. The western allies and the rebels would need to not interpret the retreat or adoption of a defensive posture by Gaddafi forces as signs of imminent collapse and try to press the advantage. Obviously I do not know if condition number 1 is in place. In regards to condition number 2, this is also unclear, although I suspect the risks are relatively low. The UN resolution would appear to suggest this isn’t as possible but maybe the biggest unknown is France, which appears unusually keen for battle. The worst case scenario here is that Sarkozy sees the conflict as a way to establish is “presidentialness” in the lead up to an election and so seeks to exploit it, dragging the rebels, and the rest of the allies down a path that needn’t be trodden. But even here, the likelihood feels relatively low. Of course, there are always thousands of other variables and I’m sure there are more than a few holes to poke in this analysis (I’m all ears for those who want to take a stab – would be great to hear more), but hope this is a helpful attempt to answer that important question. If the only choice you give someone is to fight, expect a fight. And it isn’t clear that we have the resources or stomach to fight back to the bitter end, so I hope someone in Paris or Washington DC has thought this through from this perspective. 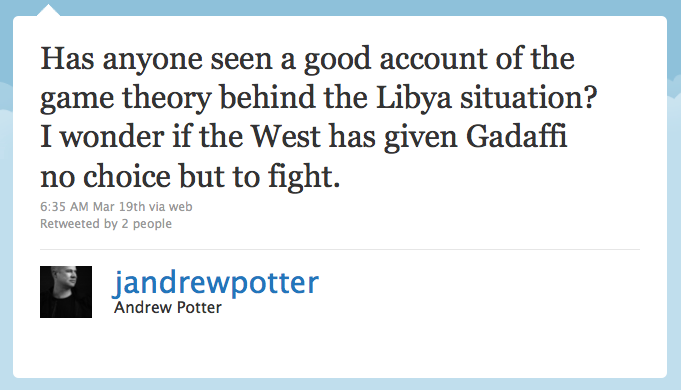 This entry was posted in canadian foreign policy, commentary and tagged Andrew potter, France, Gaddafi, Libya, R2P, strategy on March 21, 2011 by David Eaves. Well done. A very interesting analysis. 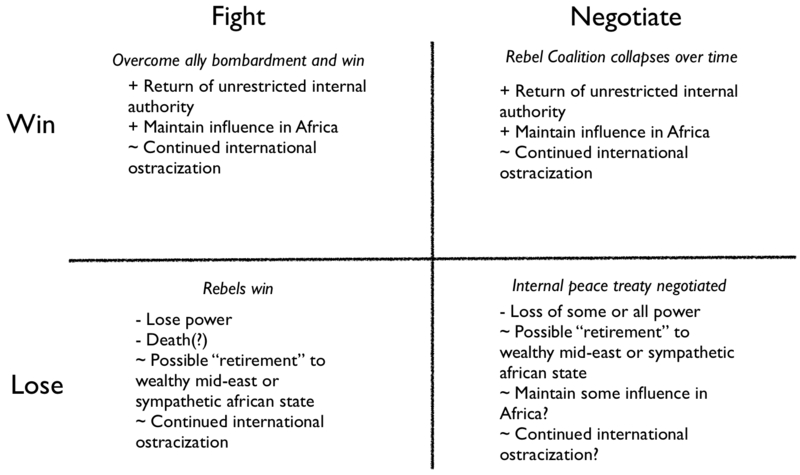 One thing I have been thinking is how to incentivize Gaddafi’s soldiers, and inner circle, to stop fighting. What could be an attractive exit strategy for them? ordered that his own boats be burnt. knew that they were committed, and it also aligned other groups to his cause. suspect that there is adverse selection in how this “Burn the Boats” story is used. who die horribly, who we don’t hear about!